Normanskill Farm in Delmar! The river has a beach right next to the parking lot. The river is all slate rock so they don't get too muddy and the water is tested by the city! 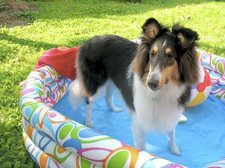 The JCC in Albany will have a Dog Splash Pool Party on Sunday, Sept. 11, 3-6 pm. It's the last day the outdoor pool is open so they don't care about dog hair in the pool because they are shutting it down the next day. It's $10 per dog and the money raised goes to rescue groups. Frankly, I don't know if it's only for JCC members or not. You can call 438-6651x105 to find out. p.s. I also don't know if it's a bad idea for a dog to swim in a chlorinated pool. Ask your vet or use your judgment on that. I'm just passing on the info that this dog swim opportunity exists. Actually the dog splash is 9/17 this year 2-6pm. Registration starts on 8/1. When I want to take my dog for a dip, we go to Peebles Island state park and I just let her have a sit in the river. The booth is unmanned this summer so it's free. On the east side there are some rocky bits you can walk down to in case you're worried about her getting muddy. @Ron -- thanks for that catch. The JCC still has the 2016 flyer on their website (but no year on the flyer itself!) so that was the source of my mistake. The Hannacroix Creek Preserve, located near Coeymans, NY (25 min drive south of Albany) has a small waterfall and swimming hole. It's about 8 feet deep. Thanks everyone! I can't wait to give them a try.